There are not many fish in fresh and salt water that have as bad a reputation as the eel. No, not the mighty Conger, the much more humble freshwater European Eel. If you have fished for any length of time in freshwater you will have quite likely come across one. The dreaded ‘bootlace’ eel, taking your bait right down it’s throat and then tangling up in your line in a big slimy ball. It’s easy to see why they are so disregarded, but when they grow past that bootlace stage, they became a very special fish indeed. This article is focused on two nights spent fishing (and fine tuning) at a local Commercial Fishery, attempting to land some of the wild Eels that lurked there, rumoured to grow to specimen weights. So humour me please as I dive into the deep and mysterious world of Anguilla Anguilla, the European Eel. 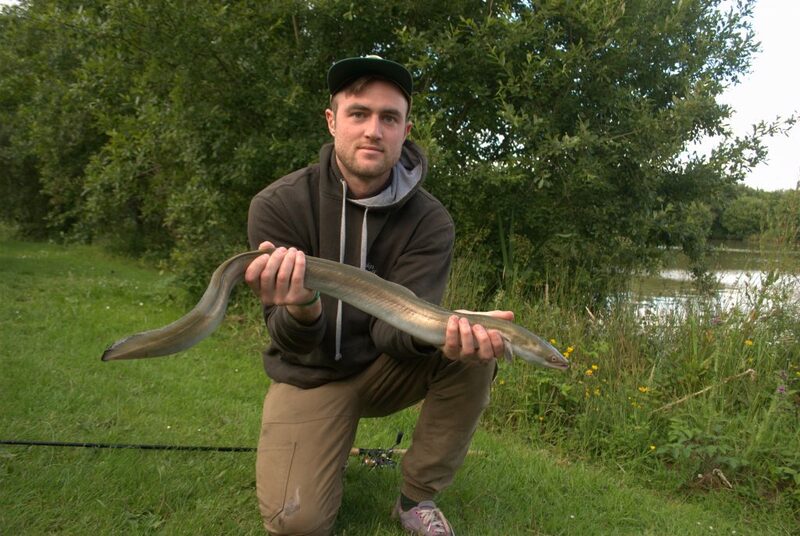 Robbie Spencer with a fine Eel of over 3lb, taken on a legered Roach deadbait. Freshwater Eels, like their larger (and much more well regarded) cousin the Conger, travel to the Sargasso Sea in the Atlantic Ocean to spawn. Travelling over 3000 miles from the rivers and lakes in the UK and Europe, through countless dangers and hazards in the ocean, to eventually spawn in an unknown location deep in the sea. Their young, tiny planktonic fry are then carried on the gulf stream, growing into beautiful ‘Glass’ Elvers on the journey. Once they reach the UK they wait in the mouth of a river in their thousands, where they often become food for Bird and Man. If they make it into the river they quickly darken and become the ‘Bootlace’ Eel we know so well. Then an even more remarkable change happens to them, depending on the environment they find themselves in (which can be hugely varied), they adapt. Their jaws will widen and their heads will broaden if there is a lot of prey fish available, or if it is mostly insect life in the water their heads and jaws will stay narrow, to aid hunting small invertebrates. This variance can lead to some really fascinating fishing results, with the more predatory fish eaters being fatter and quicker growing fish, and the invertebrate munchers becoming longer and quite possibly weighing more in the long term. All of this, from their mysterious and distant beginnings, to their unusual habitat adaptations, makes them a fascinating target for the more adventurous of us Anglers. This shot shows the large mouth of this very predatory Eel, also it’s silver underside indicates this fish will soon be heading to sea to spawn. I know what you’re thinking though, that’s all very interesting, but they are seriously slimy and still get your tackle in a mess. Well I can’t argue about the slime, but the fight you get from a big Eel on the right tackle will certainly change your mind-set, and hopefully I can give you some tips on how to prevent those frustrating tackle tantrums. I decided to fish was Bake Lakes in Cornwall. This is my local Coarse Fishery and one of my best friends Robbie Spencer helps run it. 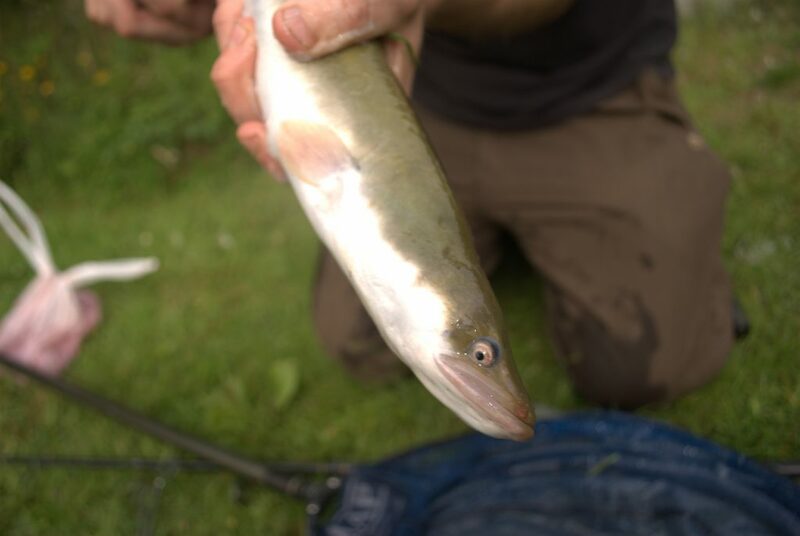 It is well known that the fishery, with its many lakes, is home to lots of Eels. They find their way into the complex by swimming up the local Seaton River, then over the grass on wet nights. Their tough biology allows them to temporarily breathe through their skin, as long as it stays damp, so crawling over grass on a drizzly night is easy work for them, another fantastic adaptation. By doing this they have found their way into every one of the lakes at Bake’s, quickly finding a lot of food on offer. There are no Pike at Bake’s so the silver fish population has no stocked predators, meaning there is a bountiful supply of prey to be taken advantage of. It doesn’t take too much imagination to realise what type of jaw profile these Bake Eels have! Robbie had caught a 4lb 10oz Eel on a lure in January (now that’s something I really have to try once the water clears), so we knew there were some decent fish present, I couldn’t wait to try and catch one. It’s very likely though that any body of water will have at least a small Eel population, with commercial fisheries like the one I fished having massive untapped potential. With Eel rigs it’s best not to overcomplicate it. With the chance of it getting tangled up in slime, you don’t want something that is difficult to re-tie. I go for a simple running leger with an 8lb Fluorocarbon trace of just over 30cm. If you are using smaller baits like prawn, then a shorter trace is sensible, but with larger baits like whole dead Roach then 30cm or more is a good idea. I’ve found this helps, as the longer trace gives the Eel a little more time to get the big bait in its mouth before it feels the resistance of either the weight or the rod tip. It’s imperative that you use a swivel to attach your trace to your mainline, Eels are renowned for spinning and twisting, you don’t want your mainline doing that too. I use weights up to just over an ounce, depending on distance required but seem to have better success with slightly lighter weights, Eels being sensitive feeders, less resistance on the line can improve your catch rate. I also use a second set-up on a bait alarm, this one I use with a semi fixed lead as a ‘bolt rig’, when the fish are in a real feeding mood this can produce some incredible storming runs. It’s best not to use a huge bait for this technique though or else you will not hook a lot of the fish. 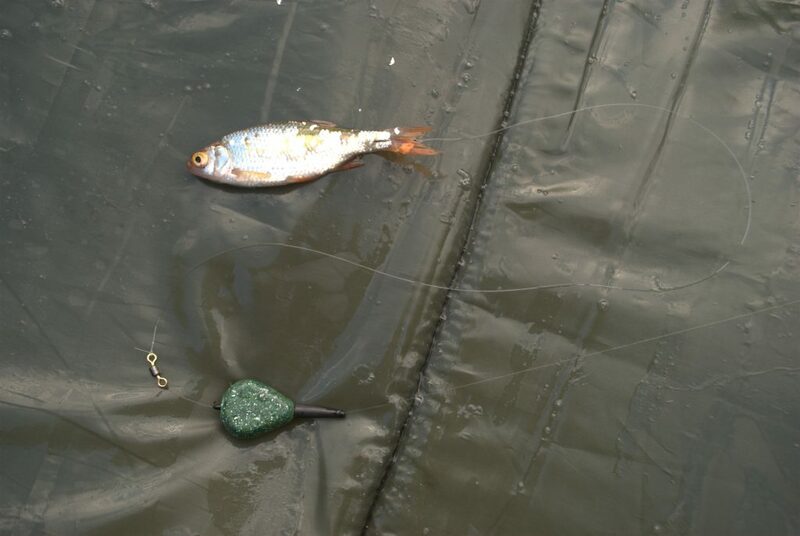 Hook size is dependent on bait, anything barbless from size 6 down to 1 in long shank should cover most needs. You can use any rod really from my choice – a commercial Quiver Tip, to Robbie’s – a 2lb test curve Carp Rod. Both can land Eels of any size, personally I prefer fantastic bite indication over strength but that’s up to you. More dedicated Eel hunters than me will have their own favourites. A deadbait mounted on a single size six barbless hook through the tail, hooking it through the root of the tail helps it to stay on whilst casting. These fish are not particularly fussy eaters, but of course there are better baits than others. In a predatory Eel environment, small dead silver fish like Roach and Rudd are guaranteed to get attention, whereas in an Invertebrate rich water, worms are your must have bait. That said, anything from maggots to cooked sausage has caught me Eels in the past so feel free to experiment. For this occasion at Bake we used both cooked King Prawn and dead Rudd and Roach up to about 12cm. The great thing about using dead baits is you know for sure that it is an Eel twitching the rod tip, but with Prawn it could quite easily be a Carp, something I found out rather quickly as I caught three before my first Eel of the session! 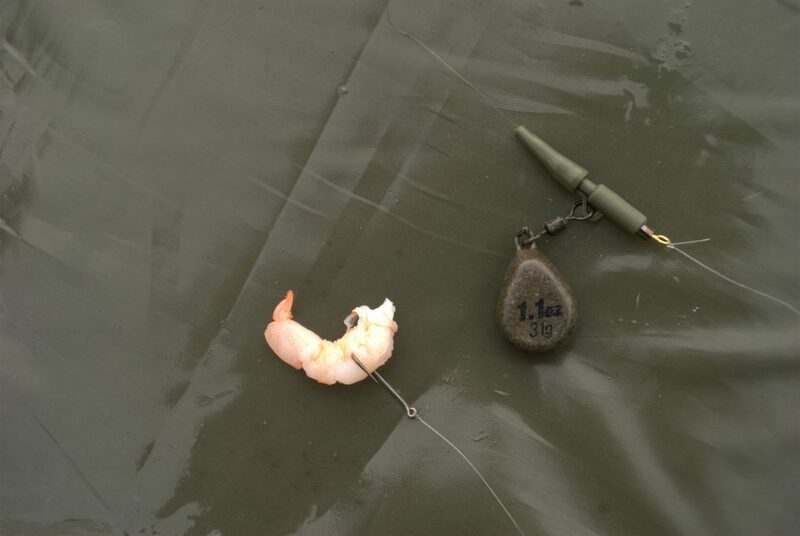 A whole cooked King Prawn on a semi-fixed lead rig, when using a bait alarm with a baitrunner, this rig can lead to some explosive takes! The first night we were set up and in the water for just after 7pm, a great time for these slippery predators to start their evening hunt. We picked a large open swim that had overhanging bushes either side, with baits under the bushes and two others on alarms out in deeper water. Robbie had his first fish only fifteen minutes in, an aggressive take that took him by surprise. The fish went ballistic and for a few minutes we thought he had hooked into a Carp by accident, that’s how hard it was running, taking line and rapidly changing direction it could have easily been one, but then that snake-like body appeared! It was a fantastic fish, over 3lb easily. It took a couple of attempts to net but after five minutes of frantic fighting it was on the bank. Being an Eel though meant that the fight did not end once it was on dry land. Twisting and turning, it is crucial you hold the trace tight away from the body of the fish and above its head, this should prevent it getting wrapped in the line and makes unhooking easier. 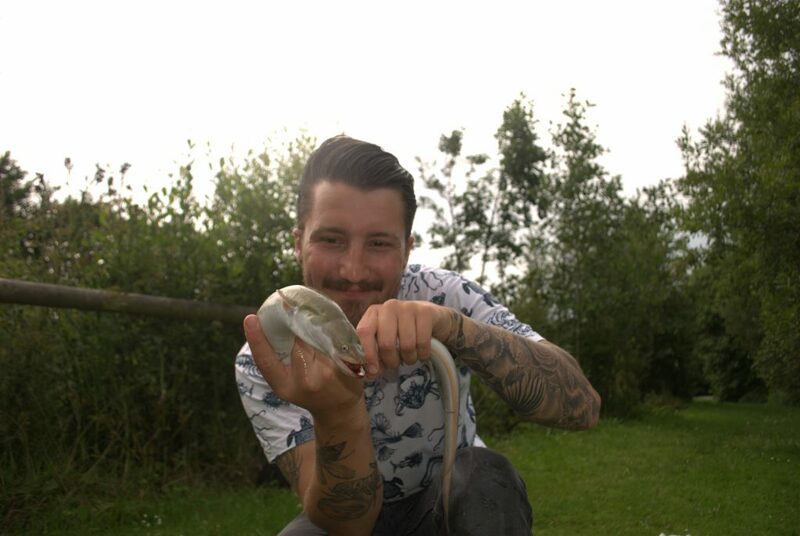 If you have someone with you then get them to (try and) hold the fish fairly straight, then use forceps to grab the hook and whilst the Eel mouth is gaping firmly twist the barbless hook out. After that process, which was actually quite straightforward this time, Robbie posed with his fish proudly for a photo. Another tip is to take a lot of photos! The Eel will be moving so much that hopefully with so many photos taken, at least one will turn out decent. The fish was then released and we cleaned ourselves up, we had brought with us an old rag that served as a sacrificial sponge to the slime that now covered our hands. During the evening we had many missed runs, some of them screaming off the bait runners like a large carp, it’s the first time I had seen Eels do that so that was an education. We realised it was because they were smaller Eels that couldn’t take the bait fully. With a smaller dead bait on, Robbie soon was playing another fish after a rip-roaring take. This one was making the line do the unmistakeable figure of eight in the water, this is where the fish is swimming backwards, whilst twisting it’s head trying to free itself. Luckily enough it stayed on and after slipping the net multiple times, was on the bank. A smaller fish but still a decent specimen. I blanked but with quite a few missed runs, I knew that with a few tweaks I would be more successful. The next night we tried again at a similar time. This time with the tweaked rigs – longer hooklengths and smaller baits. With a deadbait set up on a bait runner and alarm, I had a quiver tip set up with prawn in the margins. After three fantastic hard fighting Carp on the prawn (a not completely unwelcome distraction! ), I had my first Eel, a small fish of around a pound. The speed of the fish caught me by surprise, they can really whizz through the water. Only something as streamlined as an Eel could move like that, so impressive for one so modestly sized. Promptly back in the water I wanted a larger specimen. Robbie soon had another fish, larger than mine, quite typical! Another epic fight too, their unrivalled ability to swim backwards makes every fight different. Some will shoot off like Carp whilst others will play tug of war with you underneath the rod tip, it’s this variety and aggression that feeds my fascination with Eels. Robbie soon had it tamed though and on the bank. Pictures taken it was safely returned. I then had a run on my deadbait rod. I lifted into a fine fish, fighting awkwardly, holding in one place for a few seconds then darting off like lightening. It was the better fish that I was after, on the fairly light set-up I was using it felt it too! In the net finally, it was my turn to get slimy. Using it’s ability to ‘deathroll’ like a crocodile, the fish made unhooking it awkward, but due to holding the line tight and letting the swivel do its job, there were no tangles. The hook was popped out the corner of its jaw and then held up for pictures, obviously the fish did not want to play ball and slipped out of my hands several times before we had the photos, it’s all part of the fun of it though and it was returned into the warm lake, to terrorise the silver fish once more. Robbie had another out soon after and then we finished for the night. A productive couple of evenings, chasing a fish that is unfancied and uncherished by most, I can assure you though that those people are missing out on some exciting and arm wrenching sport. These fish always put a smile on my face. Eels are a fine eating fish, the cockneys are famous for loving the jellied variety, but I say the can keep the jelly, Eels should go back after capture. It’s actually illegal to take an angler to keep an Eel for food and by law all must be returned. This rare rule is to protect the already very damaged fish stocks. All around the world Eels of all species are threatened by extinction and we should make conserving them our highest priority. I believe by fishing for them our respect increases and we are more likely to help protect them. They are a tough species and are not particularly delicate, but they are hugely sensitive to overfishing. If you deep hook one and the hook is too far down in it’s throat (which unfortunately does occasionally happen), just cut the line as close as you can and return the fish. A barbless hook always has a good chance of becoming dislodged and regurgitated, you never know, that fish could play a key part in the future of the species. Thanks for reading and I hope this has given you a little more insight into the exciting and slippery world of the UK’s most adaptable fish. Good luck in your Eel hunting sand I’ll see you on the bank! If you liked this write up you may also enjoy my blog, where I’m charting my attempt to catch as many fish species in the UK as possible. 2 Responses to "Death Rolls & Slime – The Freshwater Eel"
they are truly amazing creatures ,but the bootlaces can be very frustrating, primarily a sea angler these days i tend to avoid fishing estuarys because of them through mid summer, in the past working as a waterkeeper i’ve caught them commercially & had many steal a deadbait while pike fishing, a riverkeeper of my aquaintance said they could be caught on the fly at dusk in one particular weirpool with a houghton ruby . though i never saw it proven. Now that would be worth an article in itself..Fly fishing for eels! There’s no getting away from it, they are a nightmare when they are small, that’s why targeting them on deadbaits and even lures is worth doing, to pick out the big ones that are worth chasing.